Now, I must admit, legal thrillers aren’t usually my thing. However what I especially liked about this story, and which makes this book stand out, is the main character, and heroine of the story, Jill Shadow. Jill’s single parent who started in the company as a secretary and worked her way up the career ladder – juggling work, childcare and study – to become a qualified lawyer. Determined and courageous (aside from when dealing with spiders) she tackles the challenges that come her way in a direct and bold fashion, even if she might be trembling inside. But Jill’s got a secret. When the unthinkable happens, and her life, and that of her child, are put in danger Jill sets out to determine the truth behind the case of drugs-mule Bella Kiss who claims to be an informant to local detectives, and the seemingly unlinked release from prison of Jimmy – her ex-boyfriend and father to her daughter Hannah. She discovers corruption and criminal activities that stretch far further than she had ever imagined. The story is told in chapters which alternate between real-time (Jill in a police safe-house, desperate to find her missing daughter) and the past (her relationship with her ex – Jimmy – and the Bella Kiss case) that has led to her current predicament. It’s an interesting structure, and one that keeps you trying to piece together the clues and solve the puzzle along with Jill. It starts at a steady pace which rises significantly in the second half. Kiss and Tell is an innovative, quirky take on the legal thriller sub-genre. Author and screenwriter, Tim Cooke, a former legal executive, was kind enough to answer a couple of questions for me. Where did you get your inspiration for Kiss and Tell? 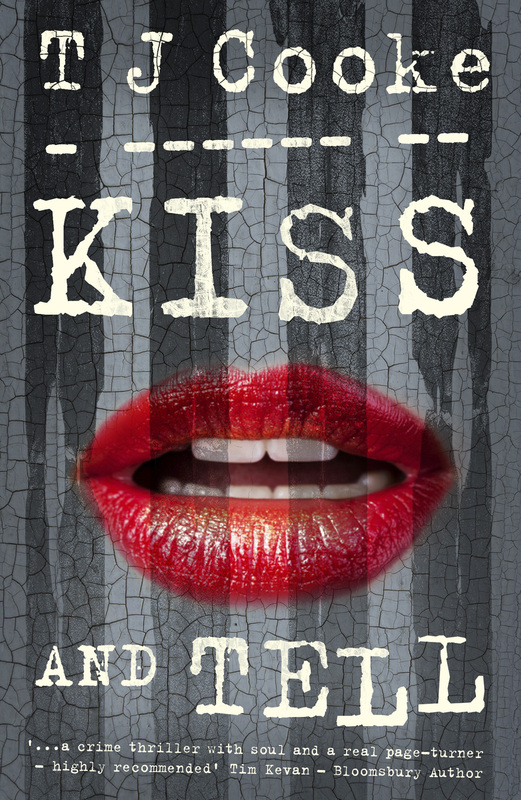 Kiss and Tell is an amalgam of two story strands, the journey of Jill Shadow, from a naive teenage secretary to an industrious and committed criminal lawyer… and her involvement in the case of Bella Kiss, which exposes a fresh and disturbing angle to the current ‘drug debate’. Both character and story are based on research over recent years. I wanted a character who broke the traditional lawyer stereotype… she’s someone who always wants to get to the heart of the matter and has no other agenda than to find out the truth. I always find a character, particularly a professional, more intriguing when they’ve had to struggle to beat the odds. As for the narrative, I have seen at first hand how our drug laws have failed society, and how they might be exacerbating rather than controlling the problem. Research then threw up the possibility that some of those who argue for the status quo in the current drug debate [ie against decriminalisation] might be doing so not to ‘protect our children’s future’ as they claim, but to further their own continued profit, via a labyrinthine network of laundered money. So now that Kiss and Tell is published, what are your plans for Jill Shadow? I’m hoping there’ll be a follow-up book, am I in luck? My second novel ‘Defending Elton is out soon. This will introduce us to Jim Harwood, a lawyer who doesn’t share Jill’s strong ethical code, and whose dysfunctional past is exposed after a fateful lapse of judgment… which results in one of the most extraordinary murder trials in the Old Bailey’s history. This will be followed by a return to Jill Shadow, who gets embroiled in a complex and dangerous ‘cold case’ murder. A case where the victim seems to be providing clues ‘from the grave’. Kiss and Tell is available now on Amazon Kindle. I was interested that you said you didn’t like legal thrillers, can you tell me why? I am interested because there seems to be a view in the publishing world that they are difficult to sell, as I think TJ Cooke found, although John Grisham seems to have made a fortune out of them. I would suggest you try Scott Turrow’s Presumed innocent, if you haven’t already. I am interested because I am a barrister and have written a novel called Crucial Evidence that I am hoping to publish. Good question. It’s not that I don’t like legal thrillers, in fact Grisham’s ‘The Runaway Jury’ would come pretty high up on my list of favorite books. It’s more that, as a rule, my personal preferences lean towards action thriller and psychological thriller sub-genres. That said, I do read a much wider range than that, and it’s great to discover new takes on themes and exciting authors in genres that I am not as familiar with. Best of luck with your novel. Thanks for the good wishes. When I get it published I hope you’ll read it. Sure, drop me an email when it’s due to be released.